Liquid Light: Flowing into the Future in the process of fabrication; the artist's design is visible on the left and bottom. Inspired by the sense of possibility around the Roscoe Station, Sam Erenberg sought to incorporate a feeling of forward motion into his artwork. To convey this Erenberg photographed the area from a moving vehicle at night. His images capture bright streams of light created by traffic lights, brake lights and illuminated signs on major local thoroughfares: Roscoe Boulevard, Canoga Avenue and Topanga Canyon Boulevard. These images are currently being translated into two 27-foot long elliptical mosaic artworks, which will be embedded into the concrete station platforms. More photos are after the jump and here’s a link to more information about Sam. Fabricators at Perdomo place the final pieces of glass. The artist inspects the finished mosaic artworks. 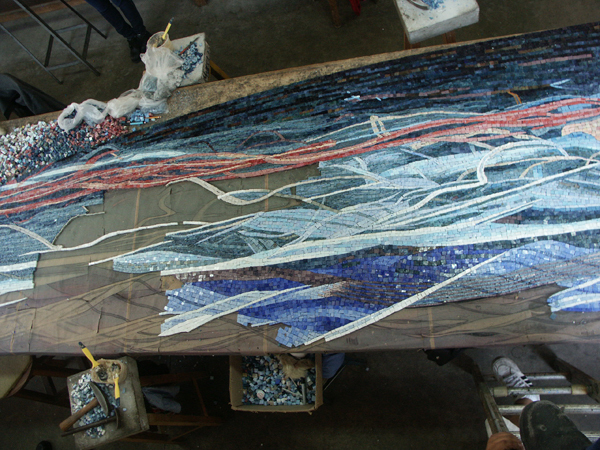 Both completed mosaic artworks are ready to be packed and shipped to Los Angeles. movement and color…suspended in glass. lookin’ good Sam. Congrats !